Donald Trump chooses language that gets his supporters scared about crime. Hillary Clinton wants the political left to know she "gets it." 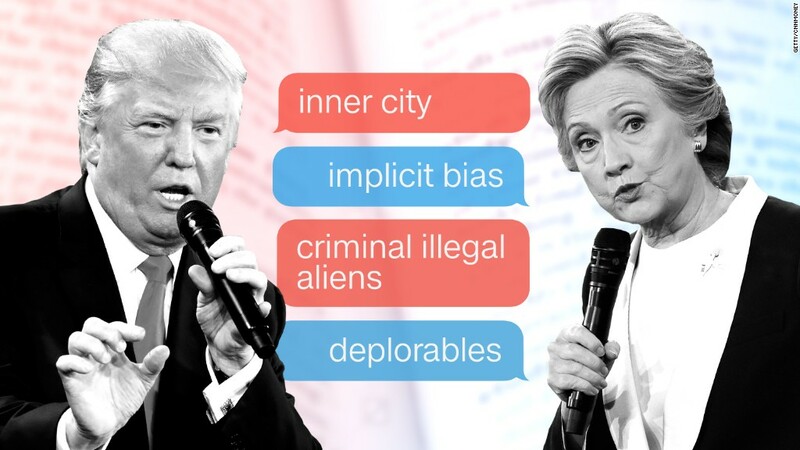 To get these message across, the candidates use a linguistic strategy sometimes called a "dog whistle." Consider the examples below as subtle but effective ways Trump and Clinton have tried to rally, wink, or tug at the emotions of their supporters when they talk about race and ethnicity. In the first presidential debate, one of Donald Trump's most memorable comments about communities of color was when he said "African-Americans, Hispanics are living in hell because it's so dangerous." Hell, it appears, is also synonymous with the "inner city" that Trump invokes when speaking about black and brown Americans, an equivalency that paints a dismal economic and social environment filled with crime and danger. "It makes no sense to use a phrase such as 'inner city' as a stand in for the complexity and variety of people of color in the United States," said Ian Haney-Lopez, a law professor at the University of California at Berkeley and the author of the book, Dog Whistle Politics: How Coded Racial Appeals Have Reinvented Racism and Wrecked the Middle Class. Phrases like "inner city" are used in this context "as a proxy for language meant to trigger negative images of people of color." Ryan Lauth, a communications professor at Northwestern University, said "inner city" invokes images of "white flight" when whites were escaping decaying urban areas in favor of what they considered safer suburbs. The term is used to invoke fear in rural and suburban voters who want to elect someone who will stop crime from spreading, Lauth said. Heather Mac Donald, a fellow at The Manhattan Institute, says those who criticize Trump for using these phrases are missing the point. "It means that you can't talk about crime without being called a racist?" Mac Donald said. "He's not assuming that all blacks and Hispanics live in inner cities, he's saying in urban areas crime is extremely high." Trump has also repeated the phrase "law and order" when describing his campaign's focus - a phrase that harkens back to Richard Nixon who ran part of his 1968 presidential campaign on the same premise in an attempt to sway Southern conservative whites. To help control what's happening in the "inner cities" (see above), Trump uses this phrase regularly. "We need law and order. And we need law and order in the inner cities, because the people that are most affected by what's happening are African-American and Hispanic people," he said in the first debate. In that same debate, while Clinton jabbed Trump because "he paints such a dire negative picture of the black community," she too struggled. She framed her answer to the question on healing the racial divide through the lens of gun control, an issue that affects all Americans, not just people of color. Clinton also called for a plan that would deal with policies like mandatory minimum sentences "which have put too many people away for too long for doing too little." Many of those policies, however, were implemented and enforced by earlier administrations, including her husband's, and led to the mass incarceration of many black and Latino Americans in the 1980s and 1990s. During the vice presidential debate, Mike Pence repeatedly used the term "criminal aliens" to describe undocumented Mexican immigrants who commit crimes. During the second presidential debate, Trump expanded the term to include the word "illegal." Said Trump: "We have many criminal illegal aliens. When we want to send them back to their country, their country says we don't want them. In some cases, they're murderers, drug lords, drug problems." For Haney-Lopez, this language represents "the boogey man of 2016" and casts undocumented immigrants as "inherently criminal" and as "dark skinned Latinos without documents preying on good decent hardworking white Americans." The term helps Trump "justify his comments about Mexican immigrants being rapists and murderers," said Lauth, by making en emotional appeal to Americans who are frustrated with Mexican immigrants "taking our jobs." In debates and speeches, Clinton has taken to using terms like "systemic racism" and "implicit bias" that were once favored by academics and are now slowly making their way into the mainstream. Haney-Lopez said Clinton was employing a more subtle form of dog whistling, a secret handshake if you will, that won't register with everyone. In addition, using the phrase "implicit bias" helps Clinton talk about racism in a way that may be easier for more conservative voters to accept, said Lauth, since it stems from subconscious prejudices that people are unaware they have. "The term implicit bias will satisfy a lot of people that are looking for a very explicit answer to the problem of police brutality," Lauth said. "It also helps her in walking that line between Blue Lives Matter and Black Lives Matter." Some of the evolution of Clinton's language around race can be linked to her bumpy relationship with activists of color who have criticized the candidate for, among other things, calling some young criminals "super predators" when her husband was president. Clinton also fumbled with wide swaths of working class white voters when she called a segment of Trump supporters "a basket of deplorables." That term, Lauth said, "makes people feel irredeemable, people that are so bad they can never come back." Haney-Lopez agreed. Trump supporters say ''I know in my heart I'm not a racist. That's an attack of me as a white person.'"